Place a PolyGrid and a PolyGridModifier into your level. For some reason the Dims on these objects are defaulted to 0.0. Set the Dim in the PolyGrid to fill in the space where you want the water surface to be. Perconally I also like to change the Dims of the PolyGridModifier as well ... just makes it easier to see. The first thing we need to do is ... in the properties of the PolyGrid at the very bottom you should see a field named "WavePropInfo". Click on it to open it up and you will see fields where you can add modifiers to this PolyGrid. 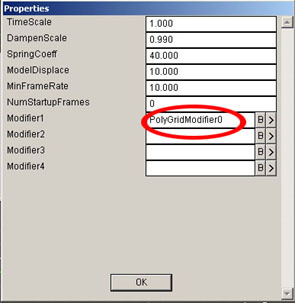 Add the name of your PolyGridModifier and once added the PolyGrid will now (when selected) show the link to the PolyGridModifier in the DEdit windows. Leave "Color1" to white and change "Color2" to black ... this will define the shadows. SpriteSurfaceName ... choose a texture of sprite from ... TexFx\Water ... using the "B" (Browse) button next to the textfield. EnvMapName ... Choose a texture from ... TexFX\Cubic ... using the "B" (Browse) button next to the textfield. NOTE: You may need to copy the file "DIRTYPETEXTURES" from another folder containing textures and paste it into the "TexFX" folder for it to show up. 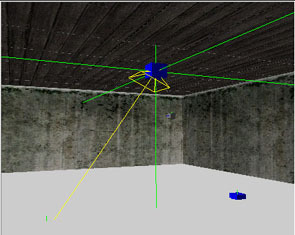 DampenImage: Since the PolyGrid is a single square object it is limited in some ways. For instance the square shape of the PolyGrid might not conform to your world's geometry. This is where the DampenImage would be of use. A DampenImage is basically an alpha mask that gives your Ploygrid a shape to it. Look at the textures in the Dampen folder ... or add one to your PolyGrid and see the result in game. NumPoliesX and NumPoliesY ... A PolyGrid is exactly what the name implies ... a grid of polies. Changing these fields will either add or reduce the number of polies in the PolyGrid. More polies equal more detail but more of a strain on performance. And the rest ... though i have my own theories ... is alot of quess work. Since we are all having to relearn alot of Lithtech editing with the Jupiter engine. Hopefully this tutorial can be added to in the coming days. If anyone can or would like to contribute your findingS with the PolyGrid please let me know and due credit will be given. Thanks to NV evewasdyn and FatWeiner for the following additions.